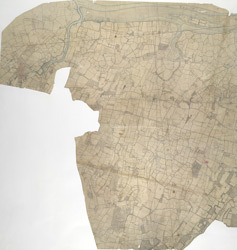 This original protraction of the Swale in Kent extends from Milton to Conyer Creek, and comprises the first plottings from the field book of the area. Ruled-black sheet lines indicate the edges of the area that were copied for the finished drawings OSD 112 and OSD 113. The plan is made up of two pieces of paper, irregularly cut and then joined together.